I realise that I’m a little late with this post, but it takes me some time to get my reading plans for the year ahead prepared. To begin with, here is a photo of the books that I’ve gained recently, which may or may not interest you. The majority of my family refused to buy me books this Christmas, I’m afraid to say, which decreases the books gained compared to previous Christmases. 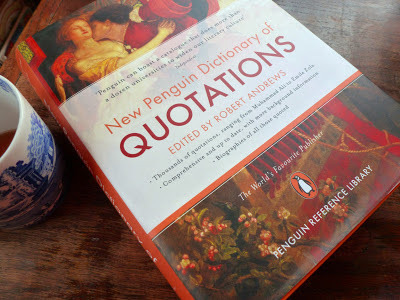 Despite this, my grandmother did get me Tolstoy’s Master and Man, alongside a Penguin Dictionary of Quotations that I’m very excited about. However, she did tell me, I quote, to “get a life”, and got me some Clinique eyeliner to somehow help this. My mother also refused to get me books, but slightly cheated by getting me the Fresh Meat book (haha). My Dad, being lovely, said he’d buy me all the books I need for my next English module. 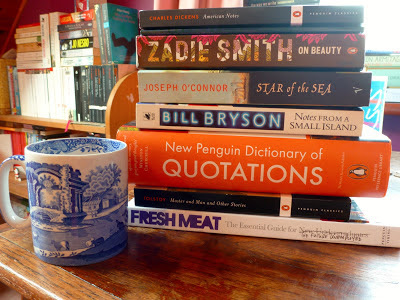 The ones that have arrived already are pictured above, including: American Notes (Charles Dickens); On Beauty (Zadie Smith); Star of the Sea (Joseph O’Connor); Notes From a Small Island (Bill Bryson). Oh, Sylvia Plath’s Crossing the Water is also tucked away under American Notes. A delivery man just knocked on the door bearing my new bookshelf, which I’ll leave for somebody with DIY knowledge and common-sense to construct. When completed, I’ll probably spend an afternoon embracing my bookishness and frequently compulsive organisational tendencies. Photos are likely to follow. But, moving on, here are my reading-related plans for 2013. I’ve divided the books somewhat into categories, for reasons of organisation and having the free time to do so. There are only fourteen books, 13.3% (ooh, unlucky?) of the 95 books I intent to read in 2013 according to Goodreads. Actually, I’ve checked and I apparently want to read 100 books – therefore, the books below account for 14%, and I am no longer unlucky. I hope that I shall read a lot more than the following, but many of these books are ones that I’ve wanted to read for some time and I’ve never quite got round to. Writing them down like this should make the goal feel more concrete. All the best for 2013 – read plentifully! Great 2013 plans. I am also thinking about rereading War and Peace at some point. Extra congrats on wanting to reread Ulysses! Thanks again for your post about Quiet by Susan Cain – it was an excellent read and very thought provoking. I look forward to reading your commentary on these works. I ma particularly interested in the Magic Mountain. It is one of the only books that I have picked up over the last ten years or so that I did not finish. There was nothing wrong with it. However, I felt that I was not ready for it. I concluded that I needed to become more familiar with certain philosophical ideas before I could appreciate it. I hope to return to it in a few years. I want to read Metamorphoses as well, and On Beauty. The Idiot is wonderful – my budgie Myshkin is named after Prince Myshkin (wrongly so, Prince Myshkin is a lovely man and my Myshkin beats up the younger budgie). Oh, and The Grapes of Wrath is utterly perfect! Charlotte – Thank you for the lovely comment! I really did enjoy Susan Cain's Quiet, and it gave me so much to think about. I'm trying to read W+P every year… I wonder if that will get boring eventually! However, I read it again last summer and I found it so worthwhile. The first time I read Ulysses I was, like many others I'm sure, a little overwhelmed :p Therefore I think a re-read will help me collect my thoughts on the book a little more concisely. I did find it fascinating the first time, so hopefully I won't hate it the second time round! Perhaps I'll do some background reading to prepare myself! o – Metamorphoses pops up so often in my university studies, so I really should read it! I can't believe I've never read The Idiot – I've read most of the works that Dostoevsky is most renowned for, but I've often been told that The Idiot is the best. Your budgies always seem so lovely! Charlotte – Thank you for the lovely comment! I really did enjoy Susan Cain's Quiet, and it gave me so much to think about. I'm trying to read W+P every year… I wonder if that will get boring eventually! However, I read it again last summer and I found it so worthwhile. The first time I read Ulysses I was, like many others I'm sure, a little overwhelmed :p Therefore I think a re-read will help me collect my thoughts on the book a little more concisely. I did find it fascinating the first time, so hopefully I won't hate it the second time round! On Beauty is on my list for this year as well! I hope you enjoy all of your picks. You will love Master and Man. That was my first exposure to Tolstoy and I've been addicted to him ever since!! I hope so! It does sound interesting, so thank you for the encouragement 🙂 All the best. Thank you! Compulsory university reading does mean that I finish novels that I've always wanted to read. I hope you have a happy year of reading, and that you enjoy War and Peace! Bleak House and The Idiot are both fantastic. You'll have a great time. As for the "get a life" comment, I've heard that for so many years already. Hopefully, you'll get used to it. I'm a constant reader myself as well. I hope you'll reach a hundred books this year. I don't think I have time for it myself. Yes, I'm pretty much used to it by now! I learn so much through reading so I'm not too bothered either. I'd rather read less than a hundred books and really take time to contemplate them, but I'll see how it goes. As I'm doing an English degree I'm able to add a lot more to my read list than most! I hope that you have time for some really great novels, regardless of the quantity. I can't wait to read Bleak House and The Idiot; I've heard such great things about them both.